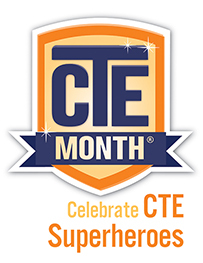 A whirlwind month in the world of CTE came to a close last week with events nationwide marking the power of CTE and its impact on communities across the country. Programs nationwide seized the opportunity to present new and innovative methods for delivering CTE. We tracked an enormous amount of content via the Twitter hashtag #CTEMonth and were proud to showcase innovative CTE Month content on our Facebook.As we highlighted in a month-long blog series in partnership with the National Technical Honor Society, CTE students across the country are doing fantastic work protecting the environment, serving their communities, getting a head start on their careers, and reinventing their lives. CTSOs harnessed the power of social media to promote CTE month by activating their membership base, creating student-made video content, and even sending student leaders to Washington to meet with Education Secretary Arne Duncan and speak at a Department of Education briefing. This CTE Month was also a big month for NASDCTEc/NCTEF events, as we released further information about our upcoming Spring Meeting (March 31-April 3, 2014, in Washington, DC) and officially opened registration for the completely revamped Achieving Excellence in CTE: the Career Clusters Institute (June 16-18, 2014, in Phoenix, AZ). Just as Senator Kaine introduced the Senate Resolution, Congressional CTE Caucus Co-Chairs Representative Glenn “G.T.” Thompson (R-PA) and Representative Jim Langevin (D-RI) each took to the House Floor to extoll the benefits of CTE to their colleagues. Improving student engagement in and increasing student access to courses in STEM subjects. Recruiting, training and supporting highly effective teachers in STEM subjects and providing robust tools and supports for students and teachers. Closing student achievement gaps, and preparing more students to be on track for college and career readiness. Many of the provisions in the bill link to our vision for CTE, especially in regard to our aim to ensure that the United States leads in global competitiveness. The bill would direct more money towards STEM, strives to prepare more students to be career ready, and increases professional development opportunities for teachers. Promoting data systems that capture individual achievement in postsecondary degrees and industry-recognized credentials. Expanding the use of information on individual participant outcomes and ensuring it is linked with the changing structure of the labor market. Making data expectations clear and consistent across the pending reauthorizations of the Carl D. Perkins Career and Technical Education Act (Perkins), the Workforce Investment Act, the Higher Education Act, and ESEA. This exciting initiative will shape the future of CTE data and accountability, and regular updates on progress will be shared with members. The aims of the WDQC initiative link very closely with our vision, through our support of federal policies that make the collection of nationally comparable, valid and reliable data possible and efficient; and our support of aligning data requirements and accountability measures among federal education and workforce preparation programs. 1.Â Â Â Â Â Reorganizing the Federal Governmentâ€™s training programs to make them more efficient, by working with the Director of the Office of Management and Budget to produce a report detailing how to decrease the number of federal job training programs without decreasing services or accessibility, using a 2011 Government Accountability Office (GAO) report as a template.The GAO report lists Perkins as one of the funds that could be consolidated. 2.Â Â Â Â Â Giving community colleges, CTE institutions, and other key educators priority access for funding that equips workers with the credentials that are in demand by industry. 3.Â Â Â Â Â Introducing accountability to job training through a pay-for-performance pilot program. 4.Â Â Â Â Â Providing states and local stakeholders with access to the data they need to track the impact of their programs. The bill would amend the Workforce Investment Act (WIA). A reauthorized version of WIA was recently passed in the House, and the Senate is currently working on their proposal to reauthorize the Act. As such, it is not clear how the CAREER Act will fit into this reauthorization process. Watch for more updates on the NASDCTEc blog as the CAREER Act progresses to Committee and more details are available. U.S. Secretary of Education Arne Duncan recently spoke before both the U.S. Senate and U.S. House Appropriations Subcommittees on Labor, Health and Human Services, Education and Other Related Agencies about President Obamaâ€™s FY14 budget proposal, which includes a number of proposals related to Career Technical Education (CTE). Secretary Duncanâ€™s written statement for the House Subcommittee contained a section called Supporting Career-Readiness for All which supports President Obamaâ€™s request to restore FY12 funding levels for the Carl D. Perkins Career and Technical Education Act (Perkins). Secretary Duncan also described the Administrationâ€™s request for $300 million to support the High School Redesign program and $42 million for the development of dual enrollment programs that align with career pathways and local workforce needs. The delayed release of the Presidentâ€™s budget, which is traditionally released in February, will likely mean it holds less influence than it normally would in affecting spending and policy changes, because the House and the Senate have already passed their own budgets, but it is still very important. Last week, the U.S. Department of Education and the U.S. Department of Labor announced the third round of grant funding for the Trade Adjustment Community College and Career Training program. The latest grant makes available $474.5 million to help community colleges strengthen training partnerships with employers and will invest in innovative and evidence-based training models that include strong partnerships with local employers and employer organizations. The grant is part of President Obamaâ€™s plan to ensure every American has at least one year of postsecondary education. Consortia or institutions that are interested in applying for funding can find more details here. Today, Representatives Thompson (R-PA-5) and Langevin (D-RI-2) sent a Dear Colleague letter to the Chairman and Ranking Member of the U.S. House Appropriations Subcommittee on Labor, Health and Human Services, and Education and Other Related Agencies requesting level funding for Perkins in FY14. The letter highlights the importance of CTE programs in ensuring workers are prepared to hold jobs in high-wage, high-skill and high-demand sectors. The letter has been co-signed by 61 members of the U.S. House of Representatives; the list can be found at the end of this post. The leadership from these representatives in promoting CTE in the current financial climate is commendable, and we encourage you to send a note of thanks, particularly if one of the representatives listed is based in your state. If you wish to express your appreciation to Representatives Langevin or Thompson for their leadership in organizing this Dear Colleague letter, you can contact them at their Washington D.C. offices atÂ (202) 225-2735Â orÂ (202) 225-5121Â respectively. This week at our spring meeting, we held a panel titled A View from the Hill – Appropriations. The panelists were Joel Packer, the Executive Director of the Committee for Education Funding (CEF); Emily Bouck, a Legislative Aide for Senator Rubio (R-FL); and Kevin McDermott, the Legislative Director for Representative Tierney (D-MA-6). The panel discussed the fiscal context in Congress, the effect of the sequestration process and how both have affected Career Technical Education (CTE). Joel expressed the view that unless Congress repeals the sequester, funding for education and CTE will be significantly reduced and will have highly negative consequences for how states deliver CTE. Kevin agreed with Joel and went on to say that while the negative effects of sequestration are not immediately apparent, organizations such as the CEF should continue to raise awareness of the cuts. Finally, Emily acknowledged the difficult financial circumstances for CTE and said that the money should be focused on those who need it the most. NASDCTEc is a member of the CEF and is actively engaged in the budget, appropriations and sequestration discussions. WeÂ reportedÂ last week that the Senate and House approved aÂ Continuing Resolution (CR)Â to provide funding for federal programs through the remainder of FY 13. Earlier this week, President Obama signed the CR into law. Since our last report, both the Congressional Budget Office (CBO) and the Office of Management and Budget (OMB) have analyzed the CR to determine whether or not the enacted legislation has exceeded the budget caps. While the CBO predicts the budget caps will not be exceeded in FY13 under the CR, the OMB predicts that the budget caps will be exceeded. As the OMB has sole authority on this matter, they are requiring an additional 0.2 percent cut to non defense discretionary (NDD) spending to ensure the budget caps are not exceeded. The expected 5 percent sequestration cuts will then be made. Since the Carl D. Perkins Career and Technical Education Act (Perkins) falls under the NDD category, Perkins funding will be reduced for FY 13. This means that the previous tables provided by the Office of Vocational and Adult Education (OVAE) are no longer accurate. Due to the unforeseen additional 0.2 percent cut, OVAE will have to run their formulas again to determine state allocations for July 1, 2013. We will pass along any additional information to members as it is provided to us. After several delays in its release date, the White House has announced that President Obama’s budget will be made public on Wednesday, April 10, 2013. We will review the Presidentâ€™s budget closely to see what is proposed for Career Technical Education (CTE), as CTE was featured so prominently in his State of the Union address. The Senate has now passed S.Con.Res.8, their proposal for the FY 14 budget. The budget passed the Senate by 50 votes to 49, with four Democrats voting against the proposal. As reported in a previous blog post, S.Con.Res.8 would replace the sequester cuts from FY14 with a balanced deficit reduction package. This would mean that NDD spending in FY14, which includes Perkins funding, would be at much higher levels than what is proposed in the House Budget, H.Con.Res.25. Budget proposals generally do not provide recommendations for program level increases or decreases but instead provide a broad framework, an overall cap on spending, and guidelines for where investments should be made. Therefore, the exact impact of either proposal on Perkins funding is unclear at this time. Now that both the House and the Senate budgets have passed, a Conference Committee will be held to discuss differences between the House and Senate proposals and for compromise to be reached. After that, the appropriations process will begin, which will provide more details on how each party would fund NDD spending. As soon as more details are available, they will be shared with members. The House yesterday moved to pass H.Con.Res.25Â to establish the budget for the U.S. government for FY 14 and set forth appropriate budgetary levels for FY 15 through FY 23. Chairman Ryan’s budget proposal for FY14, with 221 votes cast in favor of the measure and 207 votes against it. Ten Republicans voted against passage. As reported in a previous blog post, H.Con.Res.25 proposes an 11.7 percent reduction in overall non defense discretionary (NDD) spending in FY14, which includes Carl D. Perkins Career and Technical Education Act (Perkins) funding. The Senate is currently debating amendments to their own budget proposal (S.Con.Res.8).Once the final version passes in the Senate, a Conference Committee will be held to discuss differences between the House and Senate proposals and for compromise to be reached. The House yesterday also passed the Senate-approved Continuing Resolution. This decision means the bill is passed to President Obama to sign. The bill, which will presumably be signed into law, would not require any additional cuts to Perkins other than the already agreed upon 5 percent cut from sequestration. On March 20, the Senate voted 73-26 to pass its version of the FY13 continuing resolution (CR). This CR would see all Department of Education programs funded at their FY13 levels and then cut 5% by the sequester. It is important to note that the Senate passed CR does not include the 0.098% across the board cut that was included in the House approved CR. The House must now decide whether or not to accept the Senate version, which would mean dropping the 0.098% across the board cut, Â and pass the bill to the President to sign or to try to work across the chambers to resolve the differences between the two proposals. NASDCTEc will continue to monitor this ever-changing and very active policy environment and provide you with more information on the emerging budget and sequestration decisions being made. Because the Perkins Act is forward funded, the decisions made with this CR would effect the funding that states get on July 1, 2013. House Budget Committee Chairman Paul Ryan (R-WI) recently announced his plan for the FY14 budget (H.Con.Res.25). The measure, which passed through the House Budget Committee last week on a party line vote of 22-17, is expected to be voted on later today and would see an 11.7% reduction in overall non defense discretionary (NDD) spending in FY14. NDD spending includes all education and workforce funding, including Perkins. Budget proposals generally do not provide recommendations for program level increases or decreases but instead provide a broad framework, an overall cap on spending, and guidelines for where investments should be made. The Ryan budget proposal does not provide details on which programs would be reduced to achieve the 11.7% reduction in NDD, so it is unclear of the implications of this proposal on Perkins funding. The Ryan proposal does recommend moving the Community College/TAA Grant program, which is administered by the Department of Labor, to the discretionary side of the budget; it is currently on the mandatory side of the budget. Representative Chris Van Hollen (D-MD), Ranking Democrat on the House Budget Committee, had offered up an alternative budget proposal on behalf of House Democrats that would rescind the sequestration cuts. The proposal recommended maintaining the current investment in education programs and also lacks the detail necessary to know what impact would be had on Perkins funding, however the House yesterday rejected the Van Hollen budget along with all other budget substitutes. Senate Budget Committee Chairwoman Patty Murray (D-WA) also announced her plan for the FY14 budget (S.Con.Res.8). The proposal would see the sequester eliminated, resulting in more Perkins funding in future years than currently expected. It would also see $4 trillion in savings reached over ten years, as had been recommended by the Simpson-Bowles Commission. Debate on the measure had been held up until the Senate had passed a bill on the FY13 continuing resolution. Under the Congressional Budget and Impoundment Control Act of 1974, 50 hours of debate are allowed on the budget, meaning deliberations could go on until Saturday evening. The divide between the political parties is clear when comparing the budget proposals, with fierce debates expected as the measures move forward. Once both the House and the Senate pass their respective proposals, a Conference Committee will be held, allowing differences between the proposals to be discussed and for compromise to be reached. The Presidentâ€™s FY14 budget proposal has yet to be released. Typically, this proposal is released in early February and kicks off the budget debates. However, the Presidentâ€™s proposal, expected in early to mid-April, will be coming along when the Congressional debates may well be complete. The House Appropriations Committee Democrats recently released a new sequestration report â€“ A Report on Consequences of Sequestration â€“ that examines the impact of sequestration on a number of federal programs. In the education sphere, the report does not discuss Perkins or CTE, but does say that Title I Grants would be cut by more than $1 billion, impacting over 4,000 schools serving nearly 2 million disadvantaged students. In the Labor Department, cuts to Job Corps would reduce by approximately 4,300 the number of at-risk youth served. The so-called â€œGang of Six,â€ which has been meeting to devise a bipartisan grand bargain on deficit reduction has added two more members to their ranks â€“ Sen. Michael Bennet (D-CO) and Sen. Mike Johanns (R-NE). It is unclear what kind of leverage the group will have during the lame duck session when Congress re-convenes to find an alternative to sequestration.